Do your kids ever wonder what a mailman’s day look like? If they do, you might want to take a look Dr. Panda’s Mailman. It’s the latest app in the famous Dr. Panda series by developer TribePlay, and available on the App Store now. 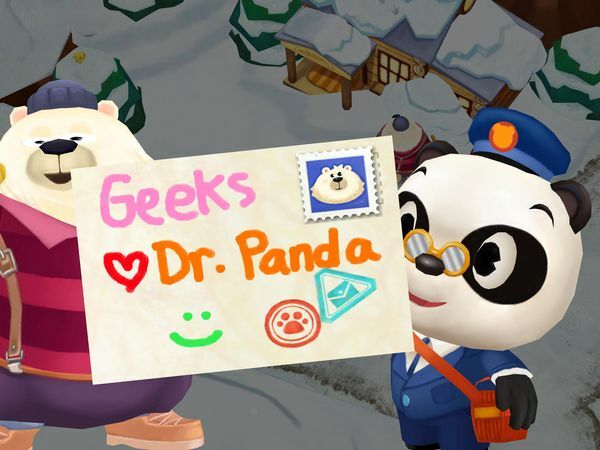 As you might have guessed, in the app kids get to help Dr. Panda deliver mail to various animal friends. 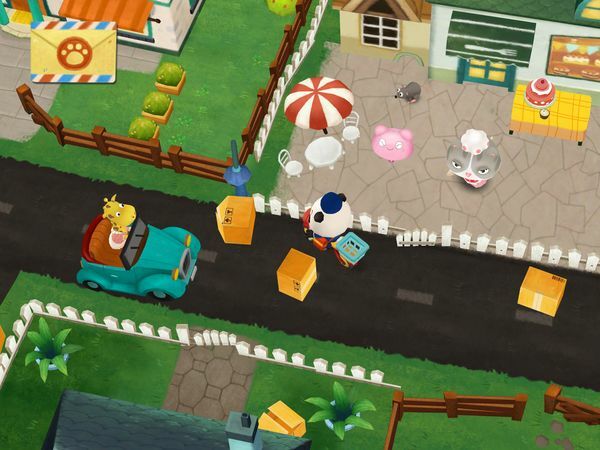 The app begins at the post office, where Dr. Panda and his assistant Toto (the adorable turtle from Toto’s Treehouse) are ready to pack and deliver mail. You can send a package by tapping on the gift box, or a postcard by tapping on the card stand. To specify your recipient, tap on an animal badge on the pin board. Both packages and postcards must be prepared first before they can be mailed. To prepare a package, you choose an item off the shelf and put it in your preferred gift box. Your item options include paper model animals, toy cars, crayons, a potted flower, and a fishbowl. Once you’ve chosen your gift, you can stuff the box with packing peanuts to keep the contents safe. With postcards, you can scribble anything you want on the back using colorful crayons. You can also use the provided rubber stamps to add more flair. Once you have finished, let Toto stick a stamp on your postcard/package. Next, it’s time to deliver the goods. Using your finger, you navigate Dr. Panda’s scooter through busy farms, lush forests, snowy mountains, and small rivers. You’ll see signs that point out the way to a specific animal’s home, but if you’re directionally-challenged like me, you can always summon the squirrel to lead the way. Once you’ve delivered your package, you can transport yourself back to the post office by tapping on the mail icon on the top left. Alternatively, you can ride your scooter all the way back while admiring the scenery. 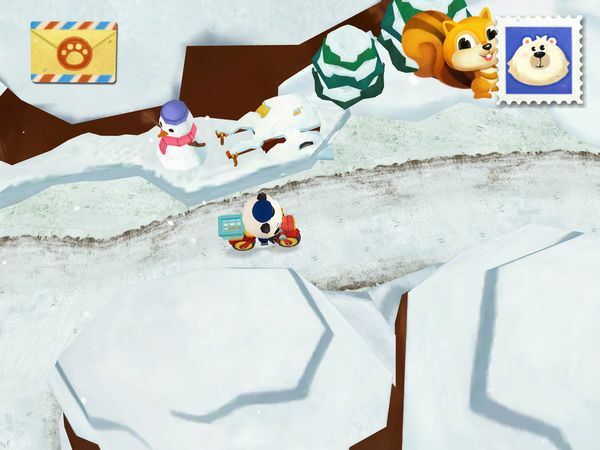 Dr. Panda’s Mailman features an open-ended gameplay with no rules and no time limits. Kids can play as long as you like, follow the off-the-beaten paths, and explore the many details that make the app fun. At the beginning of the app, kids can channel their creativity through creating postcards and choosing how packages are wrapped. You can also extend this activity in the real world by asking them to write letters to send to your family and friends. Save for some simple greetings, the app remains mostly language-neutral. It features an intuitive user interface, so kids should not have any problems navigating the app themselves. There are no ads and in-app purchases within the app. While I enjoy drawing postcards and wrapping packages, the best thing about Dr. Panda’s Mailman is exploring its vast map. There are many different routes you can take, from small dirt roads to snowy paths along the mountain, and each will lead you to interesting places. You can also discover fun tricks as you ride. For example, throughout the map you can ride up ramps in full speed to make Dr. Panda do a flip in the air. Or, if you’re feeling particularly wild, you can race against a farm tractor or scare away the flock of chicks you see on the road. Another thing I like about the app is that it allows kids to role-play as a mailman. As they zip their way through various terrains to get to their destination, they can hopefully gain some appreciation for postal workers who have to brave all kinds of weather to deliver mail. Dr. Panda’s Mailman is a fun app where kids get to help Dr. Panda deliver handwritten postcards and packages to animal friends. Exploration is the focus of the app as kids zip through a world filled with mountains, forests, houses, and rivers. There are no rules and no time limits in the app, making it suitable for kids ages 3-6.